"A thousand journey begins with a single step." 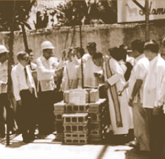 Asociacion Benevola de Cebu through the efforts of Mr. Tan Unchuan and Mr. Yap Anton, initiated the acquisition of a 49,000 square meter lot in Martires Street, Caritas. This property became the place where the Chinese receive treatment. An almost 4,000 sqm lot was purchased at Don Mariano Cui St. and construction started. To date, this remains the dwelling of Chong Hua Hospital. A charity clinic was set up to provide free consultations and medicines. Through the efforts of the President of the Board, Mr. Jose Yap, a five-storey building was constructed in front of the hospital. New air-conditioning system and medical equipment were installed including a 1,000 milliampere X-ray machine with image intensifier, set up in a newly renovated X-ray department. 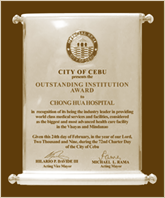 Honorable City Mayor Eulogio E. Borres awarded Chong Hua Hospital as one of the "MOST OUTSTANDING PRIVATE INSTITUTIONS IN CEBU CITY FOR 1977" under the category: Medical, Health and Welfare Institutions. (inset photo showing Mr. Benjamin Ongking receiving the trophy from Mayor Eulogio E. Borres). 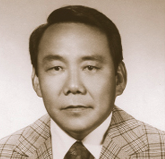 Mr. Lim Liu became the President of the Board of Directors, and remains to be the president up to this day. Addition of another set of eighty (80) beds became a reality, increasing the total hospital bed capacity to 160. Against all odds, and with the will to succeed, Mr. Lim Liu facilitated the purchase of approximately 6,000 square meter lot behind the existing Chong Hua Hospital building. Groundbreaking of Chong Hua Hospital's "Twin Towers". A massive twelve-storey structure located immediately behind the existing hospital building. On the month of May, another significant event occurred. Chong Hua Medical Arts Center officially opened its doors to the medical staff and their patients. 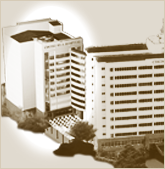 Vision: By 2005, Chong Hua Hospital will be the most advanced, fully integrated and comprehensive healthcare facility system in the Philippines that delivers ethical, compassionate and collaborative healthcare, and service par excellence-world class standards while upholding the dignity and welfare of its employees. Launching of Chong Hua Hospital's Heart Institute. The Eye Institute and the Hema-Onco Unit were established. The CT/MR Complex as well as the General Radiology underwent major expansions with acquisition of the latest imaging equipment. The Emergency and Outpatient Services was augmented up to three time its original capacity, making it one of the largest and most comprehensive of its kind in the Philippines. Having achieved its vision in time, Chong Hua Hospital sets new sights on becoming a globally recognized healthcare system that delivers leading-edged, patient-centered quality services. Chong Hua Hospital launches the first Coffee table book that chronicles nearly 100 years of healthcare service to the community of Cebu. 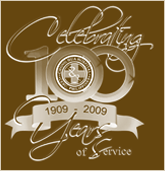 Launching of a year-long Centennial Celebration to commemorate a 100 years of healthcare service. Awarded during the 72nd Charter Day of the City of Cebu as an "Outstanding Institution", for being an industry leader in providing world class medical services and facilities, and for being considered the biggest and most advanced healthcare facility in the Visayas and Mindanao. Groundbreaking of a third tower, which will stand as the first multi-level vertical car-parking system with elevator mechanism in Cebu City. 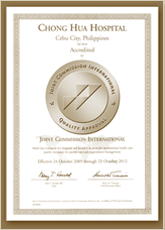 In October 2009, Chong Hua Hospital sought external validation of its quality improvement endeavors as a sign of commitment to the public and became the third Joint Commission International accredited healthcare organization in the Philippines, the only one in Visayas-Mindanao.